I received this book for review by the publisher. After going through the synopsis, I was interested in reading it and reviewing it. 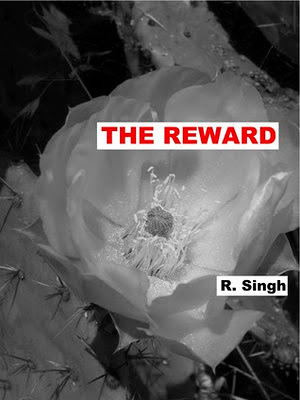 The Reward by R Singh is set is Tijuana where the protagonist, Antonio spent his childhood. Before Tijuana became a murder capital, it was a land of stereotypes for tourists. For many, it has always been home. The novel starts with a flashback to 1970 and builds to a cartel killing in 2002. Along the way, kids grow up, live their dreams and face their nightmares. Scattered details turn out to be pieces of a frightening puzzle that locks together perfectly. Antonio is dying of kidney failure and it is in his end moments that he writes this memoirs for his loved ones. Reading it today we realize how it was to be growing up in Tijuana in a tumultuous period, how the surrounding shaped the mindset and future of the people like Antonio and his friend Ramon. The author takes you through the changes that has occurred in the region over the years and how the transformed Mexico shaped Antonio's destiny. The author has given such vivid description of the regions, of the roads and the coastal areas that you can actually visualize it in your mind. I enjoyed reading about the childhood days of Antonio and how he took pleasure in surfing in the sea, walking and running on the beach. It seemed refreshing. I could well understand why his mother wanted him to learn English, as she could foresee that in future that would be language through which he would be able to communicate with the world. But there was something about the novel that did not appeal me. It constantly takes you to the darker side of life and makes you feel helpless to the point that it is depressing. Perhaps that is the reason that even the book was of only 145 pages, I took around 6 days to complete reading it. It is a thought provoking story that kept me engaged and I had to keep coming back to it to read it till the end. A evocative and well paced story that takes you through the journey of a young Mexican who grew up in a place that transformed radically with time and so was his destiny.